26 October 2018: Nature-inspired reforestation solution captures 2018 Ray of Hope Prize. Forests currently absorb just over a quarter of our CO2 emissions. Reforesting degraded areas can, together with improved forestry practices, soak up over 7 billion metric tons of carbon each year. By reducing maintenance costs and helping improve seedling survival rates, Nucleário can get more trees in the ground in less time, helping make it possible to achieve environmental agreement goals like the Paris Climate Agreement. Nucleário is an all-in-one reforestation solution, designed to be used in remote areas of the Atlantic rainforest. The device was created to function like leaf litter, preventing soil leaching and increasing soil moisture levels, and protecting seedlings from leafcutter ants and invasive grasses. It also mimics how bromeliads collect water from rain and dew to provide a microclimate that attracts biodiversity. All of this means that seedlings can thrive without needing extensive maintenance. Forest restoration plays a large role in limiting a global temperature rise of 1.5 degrees Celsius or lower. Forests currently absorb just over a quarter of the our CO2 emissions. Reforesting degraded areas can, in concert with improved forestry practices, soak up over 7 billion metric tons of carbon each year. By reducing maintenance costs and helping improve seedling survival rates, Nucleário can get more trees in the ground in less time, helping make it possible to achieve environmental agreement goals like the Bonn Challenge and the Paris Agreement. In addition to the Ray of Hope Prize, a $25,000 second place prize, sponsored by an anonymous donor, was awarded to BioThermosmart, a team with members from Mexico and the U.S. for their circular thermal management system that harvests waste heat from buildings and cycles it back into the system. Their design was inspired by how elephants, alligators, and toucans regulate temperature through their circulatory systems. The Ray C. Anderson Foundation trustees are also giving cash support to the remaining four teams, so they can each continue to work to bring their innovations to market. 1 July 2018: Game-changing ideas begin by seeing the possibilities for a sustainable world reflected in the living systems that surround us. That’s what we celebrate each year in the Biomimicry Global Design Challenge—a competition that asks innovators to create radically sustainable human designs inspired by the natural world. There are a lot of solutions to celebrate. Eight teams from around the world have been chosen as winners in the 2018 Biomimicry Global Design Challenge. In addition to cash prizes, these teams will be invited to join the Biomimicry Launchpad, an accelerator program for early-stage biomimetic start-ups, to work to bring their innovations to market. At the end of the Launchpad program in September, one team will win the $100,000 Ray of Hope Prize, sponsored by the Ray C. Anderson Foundation. FULL CIRCLE, Atlanta, Georgia, U.S. This team from Georgia Tech wanted to find a more resilient way to harvest renewable energy, so they created a nature-inspired energy generator that produces clean renewable electricity from underwater sea currents. The design was informed by the bell-shaped body of jellyfish, how schools of fish position themselves, how heart valves move liquid, and how kelp blades are adapted to rapidly flowing water and maximize photosynthesis. Their goal is to create a more efficient way to generate power, decreasing cost, and making this approach available to areas vulnerable to electricity shortage. This University of Utrecht-based team created an automated, open-source design to protect tea plants from frost damage. Climate change has resulted in more unpredictable night frosts in Kenya, which damages tea plantations and leads to economic losses and unstable incomes for farmers. Inspired by the giant groundsel (Dendrosenecio kilimanjari) and giant lobelia (Lobelia deckenii) plants, both native to Kenya, the team developed HABARI to automatically deploy a mesh where frost deposits, covering the plants and preventing the frost from settling on the leaves. HABARI increases farmers’ resilience to weather conditions, and connects the farms with the local community by using local and sustainable products. Graduate students at the Tung Hai University developed the Psephurus Air Cleaner Equipment (PACE) to improve air quality in urban environments. Residents of densely populated cities are at greater risk for health issues due to fine particulate matter in the air. In order to make the air quality in outdoor public spaces better, this team created an air-cleaning device that is incorporated into signage on city buildings. These solar-powered signs have filtering mechanisms inspired by marine creatures like salpidae, paddlefish, and peacock worms, and derived their energy strategy from prairie dog burrows, the Saharan silver ant’s light-reflecting capabilities and more. This team of marine biologists, engineers, designers, and geologists wanted to develop a better way to create resilience in coastal zones most at risk for climate change-related issues. Current coastal defense systems such as breakwaters, seawalls and revetments, replace natural habitats, creating tremendous pressure on the fragile marine and coastal ecosystems. This team studied natural tide pools, rocky shores and oyster beds to develop a fully functional and constructive coastal defense unit which encourages growth of diverse plants and animals native to the project’s environment. This team worked to develop a way to combat soil erosion problems resulting from the Three Gorges Dam in China—the world’s largest hydropower station. Yearly water fluctuation means that there is a constant erosion problem. The SSE team developed an approach inspired by the kingfisher’s “third eyelid”—a protective, retractable layer that covers the bird’s eyes while it plunges into water. Their device is a mesh structure that covers soil while it is submerged and flushed with water. The device can be retracted after the water level is lowered, ensuring that it will not affect plant growth and damage the ecosystem. GEN-RAIL, Long Beach, California, U.S. This California State University at Long Beach team developed Genrail to harness wind generated on urban freeways and convert it into energy, essentially creating a wind farm in an urban environment. This system was developed with Los Angeles in mind but is adaptable to all high-speed roadways. The team replicated the compressible elasticity of the cockroach to create safe impact zones, mimicked the California condor’s wing shape to help create energy harnessing fans, and gathered inspiration from the structure of the desert snail shell to create a system of vacuums aided by the venturi effect propelling the wind forward and providing extra power for the city. Genrail is designed to have a small footprint, be highly efficient, and be easy to produce and implement in cities worldwide. UPOD, Ithaca, New York, U.S. This Cornell University team created the UPod, a mosquito-control device inspired by the mechanism of the carnivorous Utricularia vulgaris plant. Higher average temperatures and increased precipitation events due to climate change are contributing to the expanding threat of mosquito-borne diseases like dengue, malaria, and chikungunya. Current mosquito-control strategies can be harmful to people and the environment, so this team developed the UPod to be an environmentally friendly, self-sustaining, reusable and affordable solution. Similar to how the Utricularia vulgaris plant traps prey, the UPod is a solar-powered device that pulls water and larvae into a tightly-sealed water chamber by means of a trap door that functions through a smart sensor mechanism. Larvae are suffocated in the water chamber, and then pumped out as new water and larvae are pulled in. UPod can help individuals, communities and nations take control of larvae populations and prevent the spread of mosquito-borne diseases. PHALANX INSULATION, Long Beach, California, U.S. This team, also from California State University at Long Beach, developed a biomimicry-inspired insulation grid meant to be applied to exterior walls of existing buildings. Intended to be used in urban coastal regions like Southern California, this system is designed to reduce interior temperatures of buildings passively without the need for electricity. The system includes three layers. The shade-grid layer has a wavy patterns and reflective surface inspired by the cactus and Saharan silver ant. The air channel layer, inspired by cathedral termites, directs hot air up and out of the system. The capillary layer was inspired by the Saharan camel and wheat, and can collect the morning dew from the air or pull up gray water from an underlying trough. Phalanx requires no electricity, has no moving parts, can be assembled on existing architecture, makes use of otherwise wasted water, and ultimately saves money while it cools. 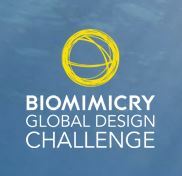 22 February 2018: The Biomimicry Global Design Challenge (BGDC) is a flagship challenge, hosted in partnership with the Ray C. Anderson Foundation. It is an annual competition that invites people to address critical sustainability issues with nature-inspired solutions and is open to students and professionals anywhere in the world. The theme for 2017-18 is Climate Change: Adaptation, Mitigation and Reversal. Each year the most promising teams in the open category of the Global Design Challenge are invited to participate in the Biomimicry Launchpad. Designed to help biomimetic solutions advance beyond the concept stage, the Biomimicry Launchpad is an intensive 12-month program that assists teams in further developing their design concepts and market strategy utilizing business training, mentorship, and legal support provided by the Institute and its partners. At the end of each Biomimicry Launchpad cycle, one team is awarded the $100,000 Ray of Hope Prize, endowed by the Ray C. Anderson Foundation. 27 October 2017: NEXLOOP, an international team based in New York City has been awarded the 2017 $100,000 Ray C. Anderson Foundation Ray of Hope Prize in the Biomimicry Global Design Challenge. The challenge is an international design competition and accelerator program that crowdsources nature-inspired climate change solutions. Team NexLoop, whose members include Jacob Russo, Anamarija Frankic, and C. Mike Lindsey, was awarded the prize at the National Bioneers Conference. NexLoop is a biomimetic systems approach and technology linking in-situ water sources with urban food production. Their AquaWeb prototype is an innovative water capture system designed for use in urban food systems, and mimics the way living systems capture, store, and distribute water. Team NexLoop developed the AquaWeb to help urban local food producers collect, filter, store, and distribute atmospheric moisture with a modular, all-in-one water sourcing and management system. AquaWeb harnesses freely available rain and fog and uses passive strategies to distribute this water so that urban farms, including greenhouses, indoor vertical farms, and container farms, can save energy and become more resilient to disturbances. 16 July 2017: The Biomimicry Global Design Challenge is an annual competition that asks teams of students and professionals to address critical global issues with nature-inspired solutions. The challenge is hosted by the Biomimicry Institute, in partnership with the Ray C. Anderson Foundation. Biomimicry is an approach to innovation that seeks sustainable solutions to human challenges by emulating nature’s time-tested strategies. The Biomimicry Global Design Challenge is a team competition. The challenge has two categories: a student-only category (high school and university) and an open category, which any team can enter (including students). Use the Biomimicry Spiral and Toolbox to research and design a solution using biomimicry. Up to 10 finalist teams will receive a $2,000 award and be invited to participate in the Biomimicry Accelerator program, which begins in October 2017 and lasts for a period of one year. Accelerator participants will receive business training and/or incubation support, mentorship support, access to software tools, legal support, and coaching and technical consultations valued in excess of $12,000. Over 100 teams entered the 2017 Biomimicry Global Design Challenge, answering the call to apply biomimicry, or nature-inspired design, to develop solutions to reverse or adapt to climate change. In the open category, winning teams have been chosen to receive a cash prize and an invitation to enter the 2017-18 Biomimicry Accelerator. At the culmination of the annual Accelerator program, participants will compete for the Ray C. Anderson Foundation’s $100,000 Ray of Hope Prize.